Specially designed Cassini orbits place Earth and Cassini on opposite sides of Saturn's rings, a geometry known as occultation. Cassini conducted the first radio occultation observation of Saturn's rings on May 3, 2005. 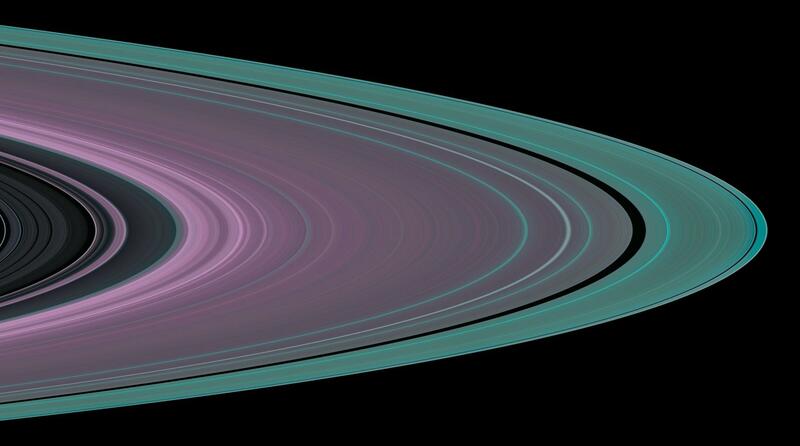 Three simultaneous radio signals of 0.94, 3.6, and 13 centimeter wavelengths (Ka-, X-, and S-bands) were sent from Cassini through the rings to Earth. The observed change of each signal as Cassini moved behind the rings provided a profile of the distribution of ring material and an optical depth profile. 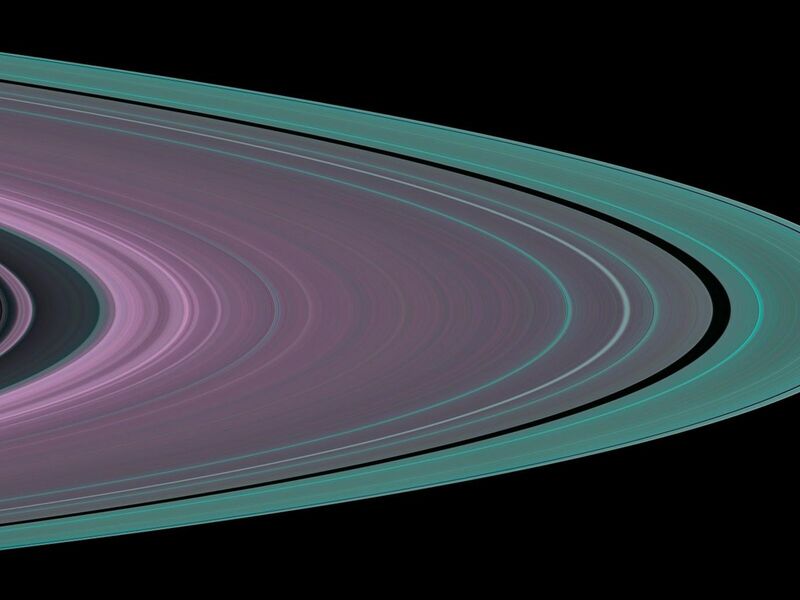 This simulated image was constructed from the measured optical depth profiles of the Cassini Division and ring A. It depicts the observed structure at about 10 kilometers (6 miles) in resolution. 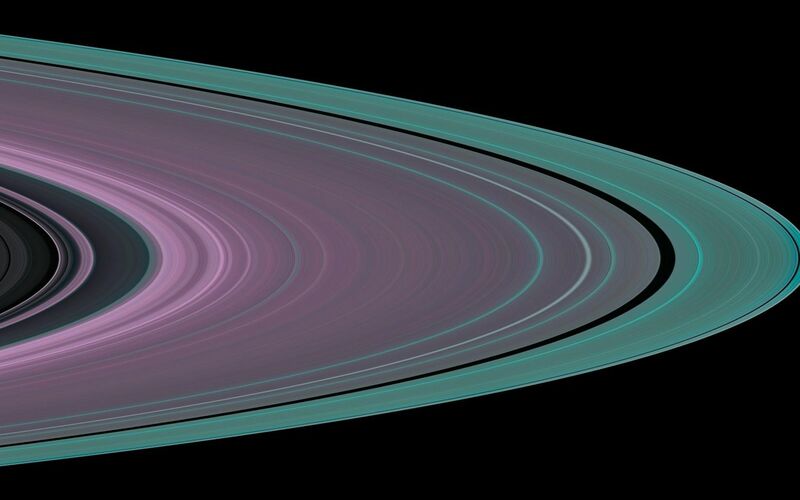 Many radial features evident across ring A, but especially exterior to the Encke and Keeler gaps (the broad and narrow black bands on the right side of the image), are wavy features called 'density waves.' They are caused by gravitational interaction with moons outside ring A. Color is used to represent information about ring particle sizes based on the measured effects of the three radio signals. Shades of purple indicate regions where there is a lack of particles less than 5 centimeters (about 2 inches) in diameter. Green and blue shades indicate regions where there are particles of sizes smaller than 5 centimeters (2 inches) and 1 centimeter (less than one third of an inch), respectively. Note the gradual increase in shades of green towards the outer edge of ring A. It indicates gradual increase in the abundance of 5-centimeter (2-inch) and smaller particles. Frequent collisions between large ring particles in this dynamically active region likely fragment the larger particles into more numerous smaller ones. The Cassini-Huygens mission is a cooperative project of NASA, the European Space Agency and the Italian Space Agency. The Jet Propulsion Laboratory, a division of the California Institute of Technology in Pasadena, manages the mission for NASA's Science Mission Directorate, Washington, D.C. The Cassini orbiter was designed, developed and assembled at JPL. The radio science team is based at JPL. For more information about the Cassini-Huygens mission visit http://saturn.jpl.nasa.gov. For more information on the radio science team visit http://saturn.jpl.nasa.gov/spacecraft/instruments-cassini-rss.cfm.